Who doesn’t love sheep? Farm animals are always big hits in my class room so be sure and show as many as you can. I also ask the students favorites and its fun to hear what they like about certain animals etc. HEAD: Start with drawing the eyes, then add the ears. Draw a big “W” for the face. Add the nose. Draw the curly wool on top. BODY: Draw a loopy line oval body to the left of the head. Add a loopy tail. LEGS: Add the pointy legs below. Color in legs, mouth and ears with pink oil pastel. Trace entire body with black oil pastel. Then add swirls for hair 5-6 total. Use green watercolor for hill and blue and white watercolor for sky. 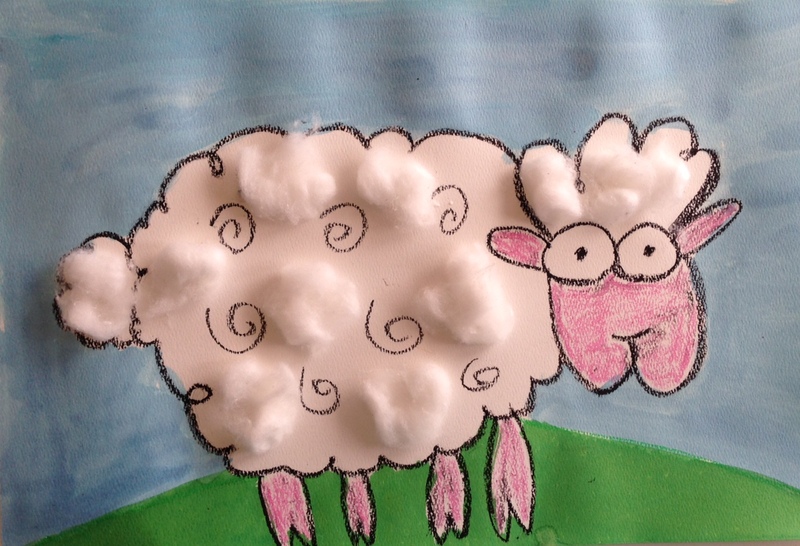 Last use cotton balls and pull and shape them for added 3-dimension to your piece. I used 5 for the body, one for the tail an 2 for the head. Optional to use white tempera and a small sponge to design a border for black paper.